May through September, 2016, I wrote a set of blog posts regarding digital literacy, starting with A Growing Understanding of Digital Literacy, and continuing with Part 2: Prioritizing Skills, Part 3: Advancing Agency, and Part 4: Exercising Agency. I also gave several talks, had the article A Radical Reconsideration of Digital Literacy published in issue 36 of Introduction to Networked Information Systems. But taking over as Interim Director of the Center for Digital Inclusion, fall teaching, and a bicycle accident put on hold further focus on what I increasingly see as an essential area for research and development in community informatics and the information sciences more generally. Digital Literacy is the ability to use information and communication technologies to find, evaluate, create, and communicate information, requiring both cognitive and technical skills. A Digitally Literate Person: … Uses these skills to actively participate in civic society and contribute to a vibrant, informed, and engaged community. Digital literacy is the skills, knowledge and understanding that enables critical, creative, discerning and safe practices when engaging with digital technologies in all areas of life. Some people associate digital literacy simply with the functional skills of being able to use a computer or particular software package effectively. But digital literacy is about much more than having access to or being able to use a computer. It’s about collaborating, staying safe and communicating effectively. It’s about cultural and social awareness and understanding, and it’s about being creative. Being digitally literate is about knowing when and why digital technologies are appropriate and helpful to the task at hand and when they are not. It’s about thinking critically about all the opportunities and challenges digital technologies present, whether these are, for example, Web 2.0 tools such as social networking sites and Wikis or animation and editing software or digital cameras. I also reviewed the UNESCO 2011 Policy Brief on Digital Literacy in Education, which emphasizes digital literacy is an essential skill for life-long learners, educators in both K12 and Higher Education schools, business leaders, and a range of other professionals. It is not simply a skill developed in childhood and then practiced as is in adulthood, no more than our reading and writing literacy skills are practiced as a graduate student or professional are performed identically to the way we practiced them as a 5th grader. But as do many other skills, practices, and policies, digital literacy skills can sometimes privilege some over others. To this end, UNESCO emphasizes the important of competences concerning digital technology policy development, digital pedagogy development, interpersonal skills, and environmental consciousness for digital literacy educators and learners alike. In response to these insights from the Futurelab handbook and UNESCO Policy Brief, I have considered yet again the deep urgency to teach for justice, particularly following my reading this week of the new book Teaching for Justice edited by colleagues Nicole Cooke and Miriam Sweeney. There are many different ways for a digitally literate person to harness base skills to find and evaluate information, and to use that information to their benefit. Only some ways also serve civil society and contribute to a vibrant, informed, and engaged community. We need to consider, then, that there are many different social, ethical and legal issues that are informed by, and inform, our cultural and social awareness and understanding, and guide collaboration and creation in a pluralistic society. 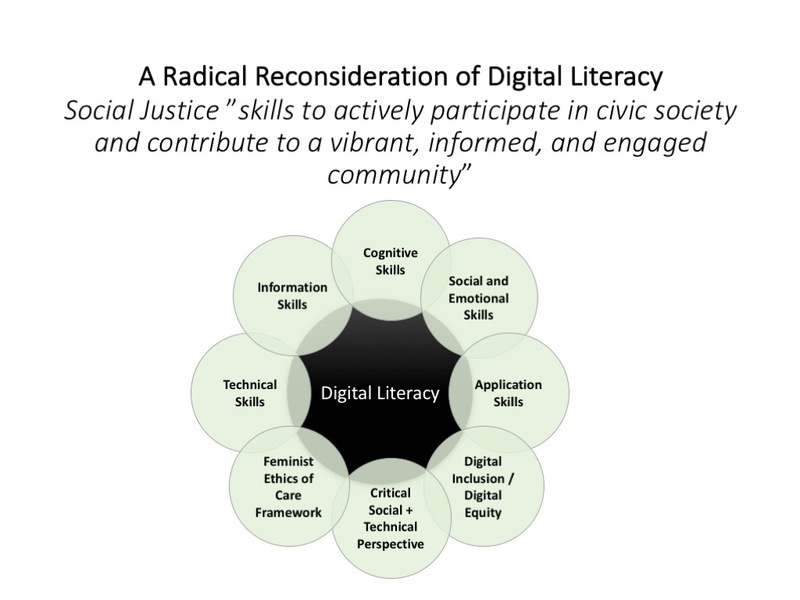 As such, implementation of core skills by a digitally literate person is always an act contributing to works of social justice and/or injustice — there is no neutrality in practice of digital literacy skills. As a result, I’ve also spent the last couple of days considering whether a feminist ethics of care approach is another essential part of implementing social justice within digital literacy. This concept builds from the recent article Creating Caring Institutions for Community Informatics written by colleagues Miriam Sweeney and Colin Rhinesmith. But my consideration of ethics of care also builds from my recent dependence on a range of social work, therapist, doctor, and family caregivers, many of whom are in solidarity with a feminist ethics of care framework. I am now convinced that digital literacy, as a required competency in the 21st century, needs to be shaped by the feminist ethics of care framework if we are to implement care as a relational process that is a routine part of every aspect of professional practice. Yesterday I began working on my opening presentation to my fall students. Last year’s presentation emphasized the importance of a reconsidered digital literacy within our co-learning in class. In doing so, I highlighted that beyond information skills, we needed to advance our information, cognitive, social and emotional, and application skills within a critical social + technical perspective. This year I add to that a feminist ethics of care framework and a consideration of social, ethical and legal issues related to digital inclusion and equity. But over and above these two essentials, I now put forward that when, as a community of inquiry, we practice a feminist ethics of care, we also further digital literacy as a social justice skill.